Nowadays, hair fall problem is gradually increasing. Many young adults have been complaining about hair loss issues. Some of them complain about genetic or hereditary kind of hair loss, while some of them complain hair fall after the use of certain medications or due to some external factors like change in weather, change in water, etc. Alopecia is a medical term for hair loss. The most common form of alopecia is androgenic alopecia, which is commonly seen in both men and women. It affects approximately 70% of men and 40% of women. In men, this condition is called as ‘male-pattern baldness'. Men are primarily present with hairline receding backward followed by thinning and loss of hair on the vertex of head and sides of the head or scalp and then progressing to partial or complete baldness. In women, this condition is called as ‘female-pattern baldness’. Women present with the thinning of hair all over the scalp with no receding of the hairline. It rarely leads to complete baldness in women. Androgenic alopecia can start as early as at the beginning of teenage years; however, the risk of hair loss increases with age. Usually, this condition occurs after the age of 40 in men, and it is most likely after the menopause in women. The reason for alopecia varies in both the sexes. The following are the general causes for alopecia. Scalp infection - dandruff, eczema, ringworm, psoriasis, etc. Drug abuse and excess use of cosmetics on the hair. After terminal illnesses, chemotherapy or radiation therapy. Poor nutrition and unhealthy eating habits. Other factors like pollution, water quality, air quality and other toxic products in the environment. Many patients come to homeopaths for hair loss treatment. Androgenic alopecia mainly affects the people of 40 years old. However, many young people suffer from androgenic alopecia, like at the age of 20 or 25 even though their fathers got bald after 30 years old. 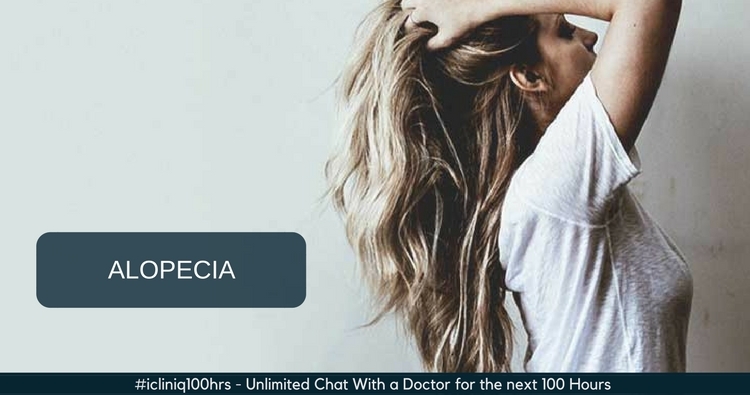 Intervention with homeopathic remedies surely helps to prevent the further hair loss and to some extent gain the lost hair. Most of the homeopaths prescribe some common medications without much individualization. However, the cure takes place only if the remedy is prescribed based on the complete totality of symptoms and after understanding an individual in depth. Arnica mother tincture is not the most individualistic solution for the alopecia; however, it is effective in stopping the extreme hair loss. I usually do not prescribe this remedy unless there is severe hair loss and if patients are looking for immediate relief from the problem. Mix two drops of Arnica mother tincture with a half cup of coconut oil and massage to the scalp. This mixture not only reduces the hair fall effectively but also promotes hair growth to some extent. It is one of the best remedies for excessive hair fall. This medication has shown excellent results in people suffering from hair loss due to any cause. It also helps to treat dandruff and other diseases of hair. It increases the growth of hair and makes hair strong by providing the best nutrition to the roots of the hair. It is available in the form of oil and mother tincture. This hair oil may be used regularly to increase the strength and thickness of hair. Jaborandi tincture is helpful for hair fall with dry scalp and dandruff. A mixture of 10 drops of Jaborandi tincture in hair oil can be massaged into the scalp at bedtime for three to five months. This remedy is mainly indicated in the people who suffer from premature alopecia or androgenic alopecia at the young age. It is indicated when there is severe falling off of hair with itching in the head, and the new hair that comes are dry and breaks off easily. This remedy is well indicated if the hair fall has started after severe grief or mental stress. Natrum muriaticum is very similar to Phosphoric acid. Natrum Mur is also indicated when hair fall starts after sorrow, loss of loved ones, or same kind of emotional and stressful event. In Natrum Mur, alopecia is also associated with parturition, lactation and chronic illnesses. Several such remedies can be prescribed for hair loss problem. It is essential to understand the cause of the problem before starting any homeopathic remedies. A well well-experienced homeopath would be able to understand the issue and prescribe the correct remedy for the same. Do you have a question on Androgenetic Alopecia or Causes For Hair Fall?